*If you like to take other specialty dives aside from the adventure dives mentioned above, feel free to discuss this with your instructor. Your instructor will meet with you prior the course proper for a briefing and to give you the dive learning materials needed for your home-study. The following action items below need to be completed prior meeting with your instructor for the knowledge review. You and your instructor will meet to recap your answers on the knowledge reviews. He will also highlight important points and review the items you may have missed. This is where you will master the skills and concepts learned from the book and during the knowledge review. 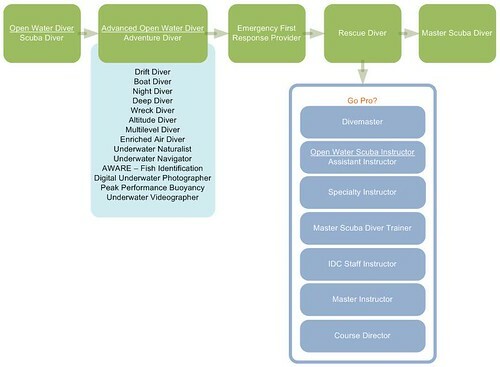 To earn a specialty diver rating, it ranges from 2 or more dives depending on the specialty diver course. This would require at least 2 weekend dive trips to complete the specialty training dives. 1. Course Fee is dependent on the fees of the 5 specialties to be taken. PADI Registration costs $55. * Students will have to bring their own gear (mask, snorkel, fins, BCD, regulator, weights, exposure suit). ** Students will also have to bring 2 underwater flash lights, 1 inflatable signaling device and compass. *** Your instructor will help you with your rentals in case you don’t have your own gears yet. 3. Transportation Cost and other incidental (snacks, soda, etc) are not included in any of the fees mentioned above. a. If there are circumstances that will make you unavailable on the agreed upon training schedules, you have to inform your instructor 24 hours ahead of time to give him time to cancel the dive resort reservation. b. Failure to make the courtesy notice 24 hours before the training schedule will incur additional charges on your course fee to cover for the resort penalties. c. If you have to cancel your training schedules 3 times or more, you will be charged an additional 10% of the course fee to cover for logistics expenses. d. Though the course is performance-based (and not time-based), if the student unusually needs more training time, your instructor may request for additional charges to cover for extended training sessions. Your instructor will discuss this with you if needed. a. First Payment – 65% of the course fee upon receipt of the Advanced Open Water Diver Manual. b. Second Payment – 35% of the course fee on or before the start of the actual Advanced Open Water Training Session.